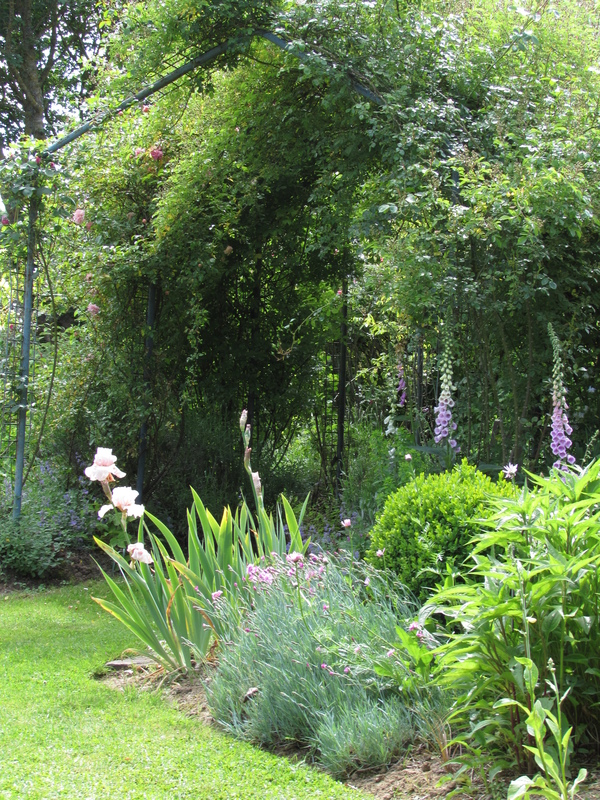 For some time I’ve been meaning to share pictures of a garden about a two-hour drive from here, much deeper into the Vosges mountains and the département des Vosges, but still in the same administrative region as Châtillon-sur-Saône. The Vosges are a very old range of mountains. Their antiquity means that the peaks are not jagged and spectacular, more mellow and rolling. When I lived in Alsace, near Basel, we used to be able to see the Vosges to one side of our town and the mountains of the Black Forest in Germany to the other. Their shapes mirrored each other perfectly. I was often inspired to paint while looking at the mountains from the dirty pavements of Saint-Louis. And I was struck by the epithet (later used politically) coined in 1893 by Jules Ferry, a French statesman and politician: ‘La ligne bleue des Vosges’. The blue line of the Vosges, which Ferry wanted to face from his home town of Saint-Dié-des-Vosges when he was buried. 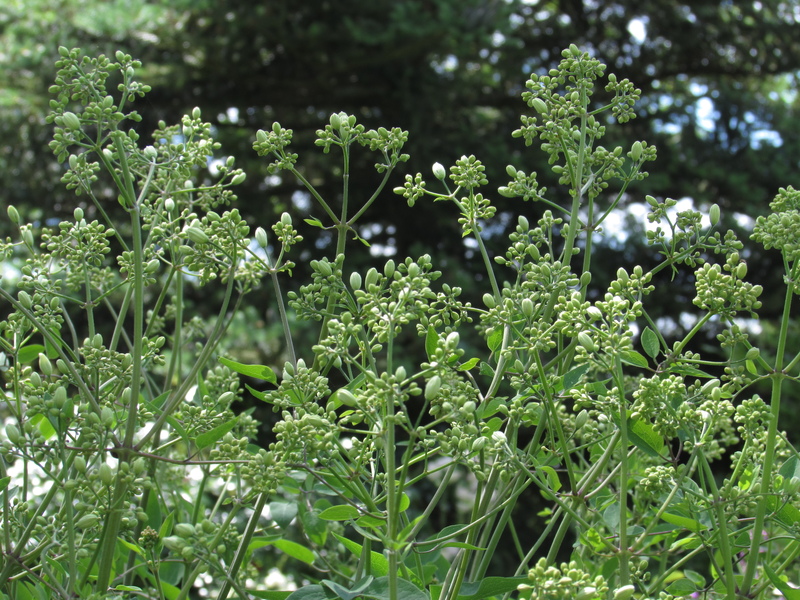 Blue-green, misty and enticing on a hot summer’s day, emerging from the flat, heavily populated plain of Alsace. Don’t be fooled by the gentleness of these big hills. The Americans fought some of their harshest campaigns during the Second World War in the Vosges, when they came from the south of France and used the mountains as a doorway to liberate Alsace from the Germans. They came in the autumn of 1944 and the following winter was the coldest on record. Nowadays people take happier advantage of the snow and cold. There are areas near the small town of Gérardmer in the Parc National des Ballons des Vosges where skiing is a big industry. 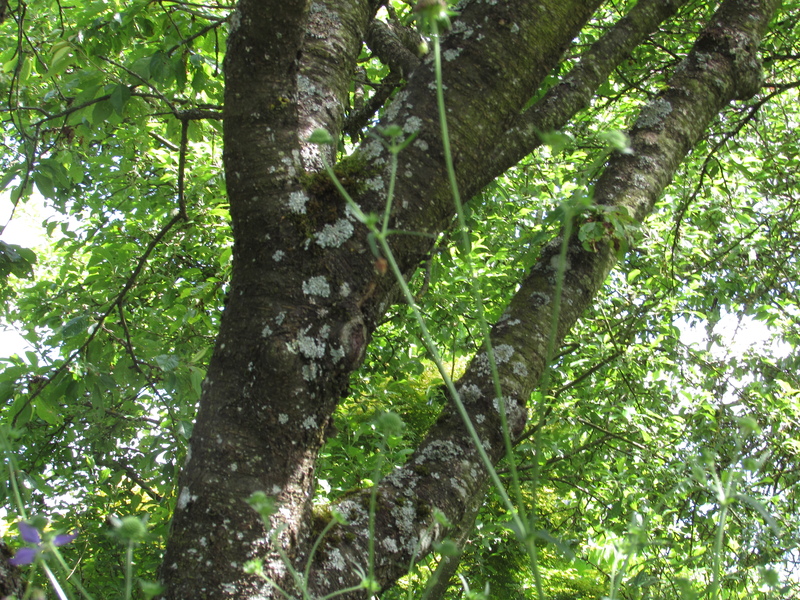 Thierry Dronet came to Berchigranges, close to Gérardmer, in 1978 to establish his carpentry workshop on the site of an old 1950s granite quarry, planted with spruce after 1960. He built the blue chalet-style house you saw in the first picture and dreamed of opening up the landscape and reinstating the wild flora typical of the region. 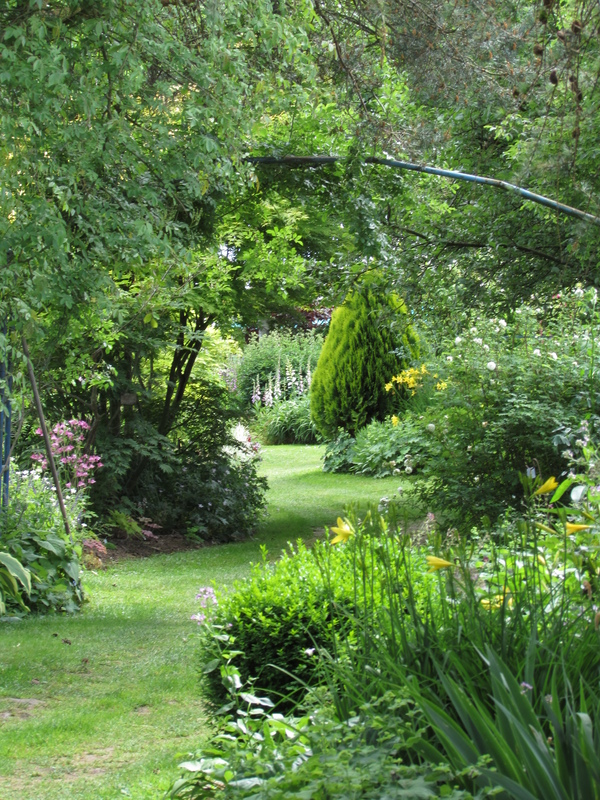 In 1990 he met his future wife, Monique, who was running a plant nursery nearby and was in love with the cottage garden style – and from there the garden grew. 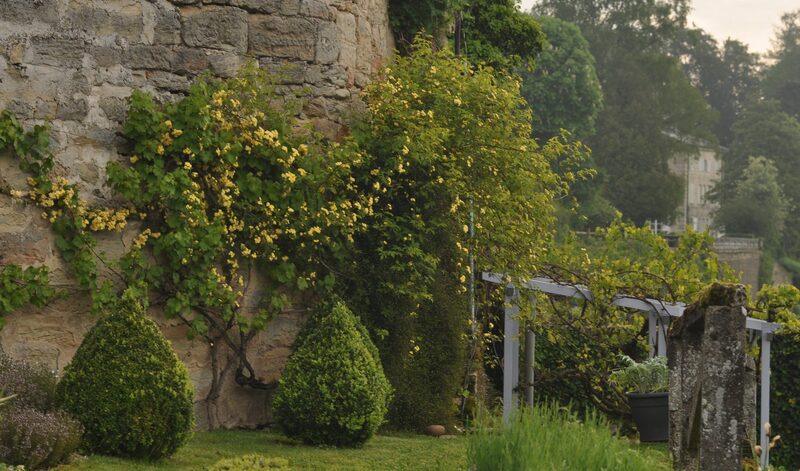 The land that drops away from the house reflects Thierry’s original plans, but the garden itself is much more formal. Here even the daffodils stand to attention. I can almost see Thierry getting his ruler out and measuring distances between bulbs as he plants. 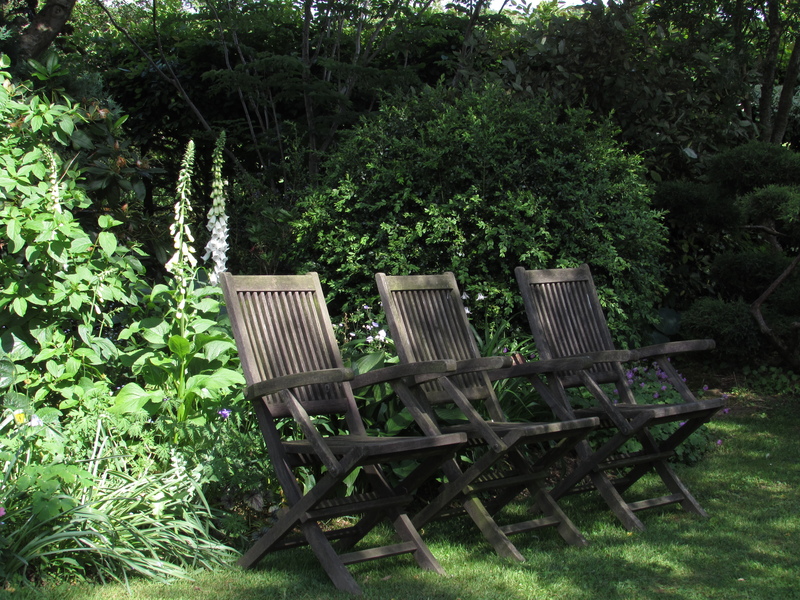 Aside from that minor flaw, the garden is a real pleasure in an area bereft of ‘good’ gardens (whatever that means!). They had to cut down thousands of spruce, relocate tonnes of rock and order in 200 lorry-loads of topsoil, not to mention collecting thousands of plants. A little perspective on my own strimming and digging? 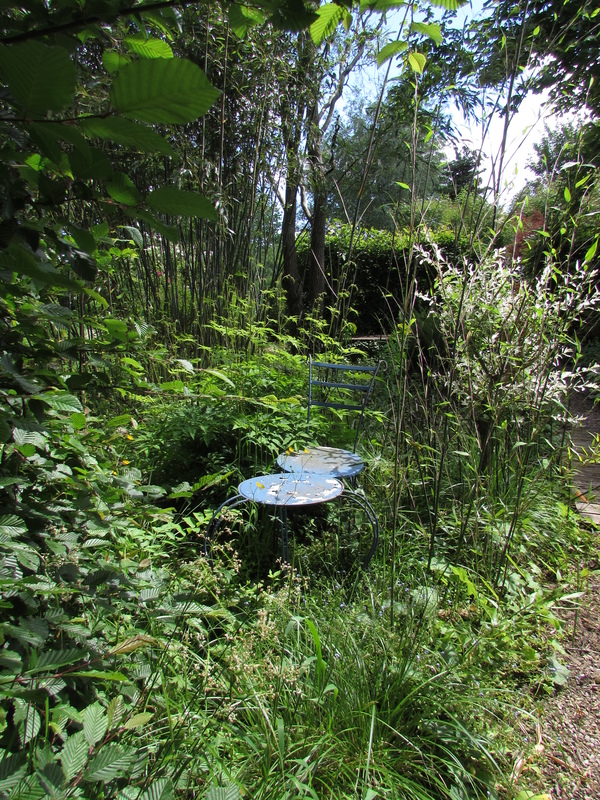 If you go to visit the Jardin de Berchigranges, it is Thierry on his own that you see beetling about the grounds. However, he now has a staff of (I think) about 11 to help him cut the hedges, so don’t panic when you see the pictures that follow! It’s the hedges I’ll focus on in this post. The pictures come from two separate visits, timed to coincide with the narcissus days they celebrate each year towards the end of April – hundreds of cultivars have been planted over the years. I love they way they display cut narcissus on tables in the garden. Each bloom, with its name in a little jar. Just like being back at Vincent Square and visiting a Royal Horticultural Society spring show. There’s also a small nursery attached to the garden – one of only two places that I can actually drive to and buy decent herbaceous plants around here. Otherwise it’s mail order only. The first year I visited (2014) the hedging was far more advanced than the second year (2015). The pictures from the two visits below have the advantage of showing the development of the bones of the structure into foliage cover. Hornbeam hedges (much better in heavier soils and wetter conditions than beech) demonstrate how well plants can perform to give structure to a garden. The Jardin de Flipper lies at the top of the garden’s slope – inside it you are almost lost as if in a maze. Outside you look up to a colossus mimicking the ramparts of an imposing castle. Since I’ve recently planted a ‘walled’ garden made with hornbeam myself, I took particular note of planting distances for the hornbeam and the way in which each plant has gained full height before being clipped – this makes the hedges just as (if not more) spectacular when not in leaf. Close to the Jardin de Flipper is the entrance to the Dames’ Room. I could have typed ‘women’s room’ there as a translation, but aside from making the area sound as if it was a outdoor toilet, there is an almost medieval feel to the garden that seems to demand we be ‘dames’ here. It’s a walled garden of hornbeam, in which to sit peacefully out of the wind and savour the scented plantings that the garden features (although not in April!) It also allows a closer appreciation of the beauty of hornbeam hedges. Well, I think it’s Pyrus salicifolia! And easily my favourite feature in the garden. 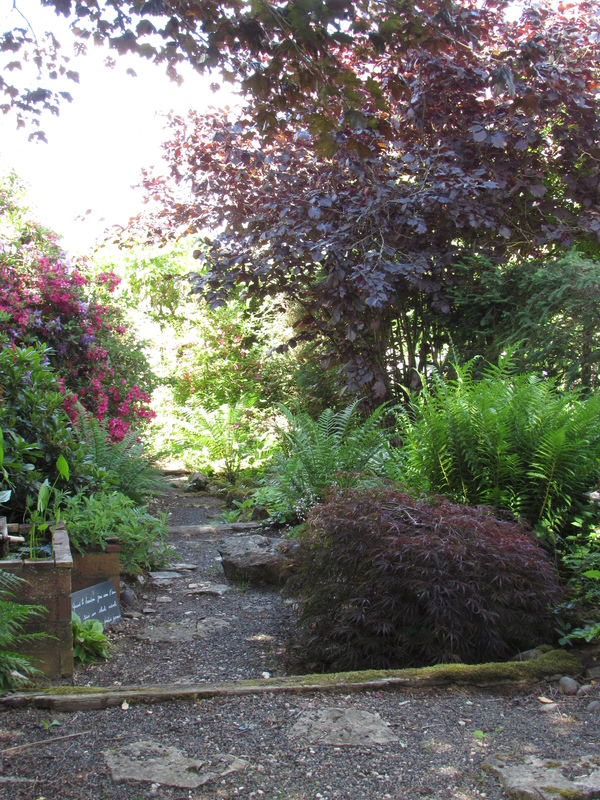 The terracing in this sharply sloping position is, as you can see, created with logs and there is a serpentine path that winds below the hedge, just as the garden drops to the wilder valley. I believe (but am not sure) that this is the boundary of the Garden of Garlic & Ouch (Jardin Ail et Ouille). Plants from arid habitats – spines, grey-foliage and, of course, alliums – feature there, in the terrace garden to the left of my picture above. The hedge forms the boundary. Does it matter if I’m right or wrong? This hedge and terracing are simply stunning. 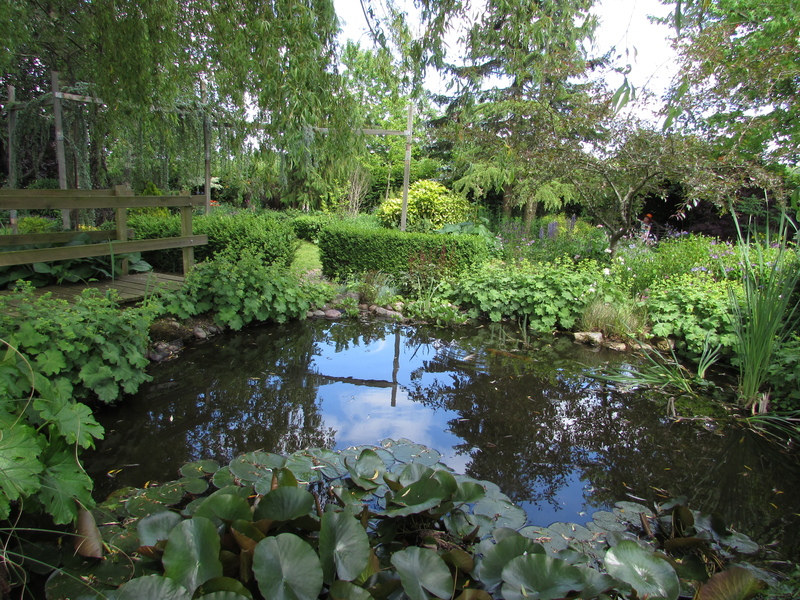 If you are interested to find out more about Berchigranges, have a look at the Jardin de Berchigranges website. This entry was posted in French gardens to visit on April 30, 2016 by Cathy. 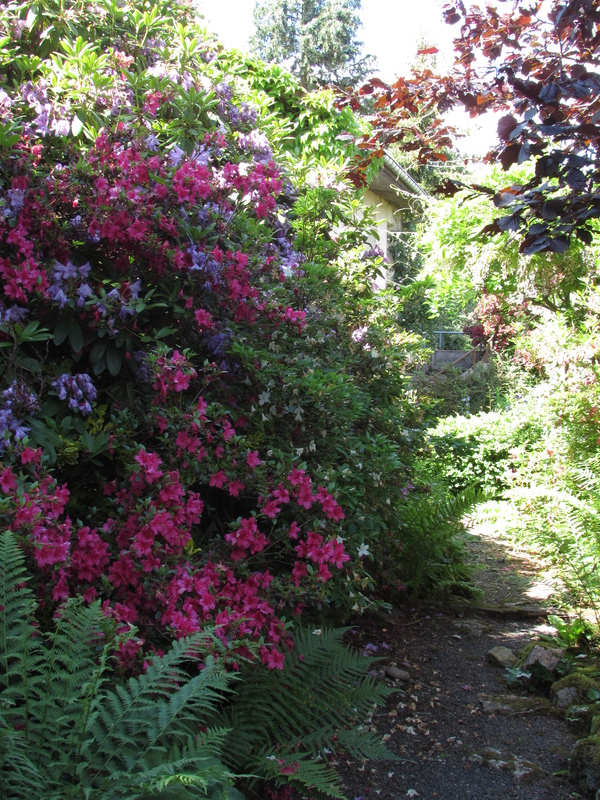 This post is really just to prove two things: first, that I do, occasionally, go out; and secondly that Lorraine has more gardens worthy of a visit than one might imagine. I wouldn’t say we were a Mecca for garden lovers, but the gardens are there, if you know where to look. 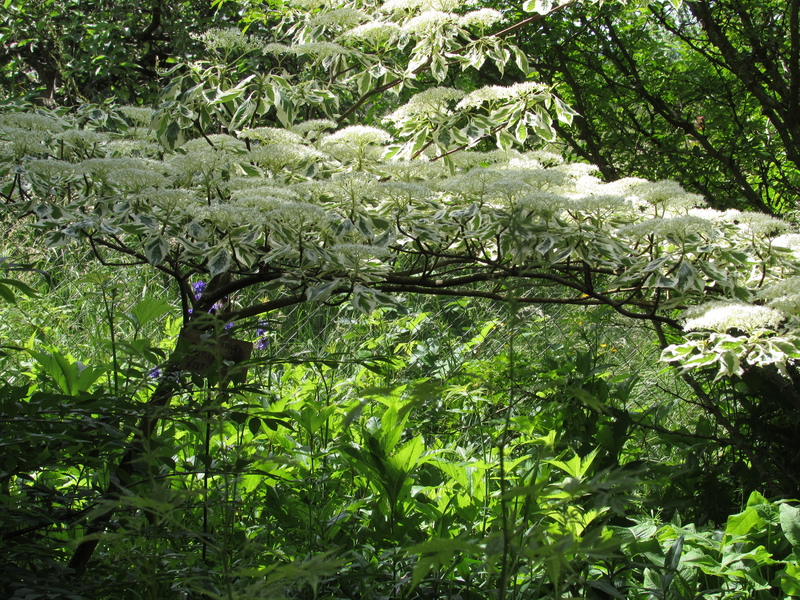 Last week I visited this woodland garden, the Jardin d’Ode, with some friends. We were mainly in search of plants to buy. 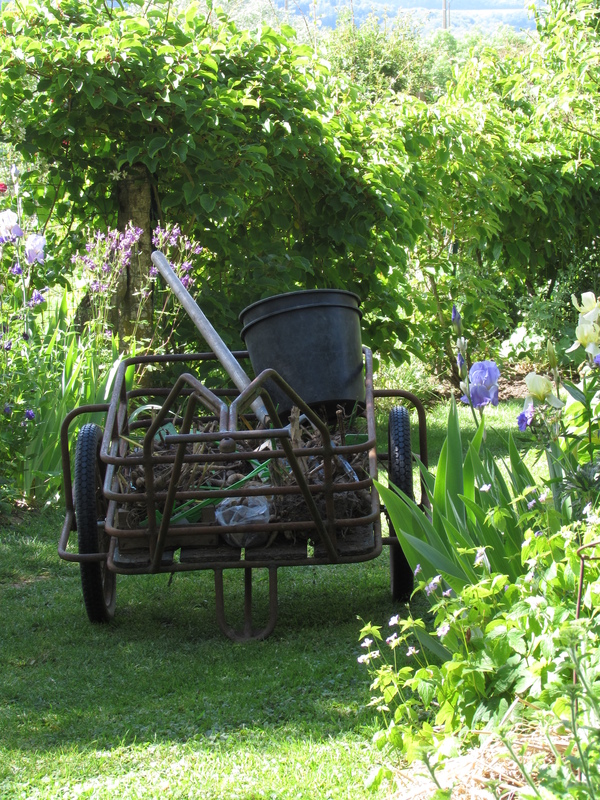 The garden is run by a mother/father/son team and they have a small nursery attached. Unfortunately they were in the midst of a massive upheaval and many of the plants were doing an unlabelled walkabout or were too tiny to sell. 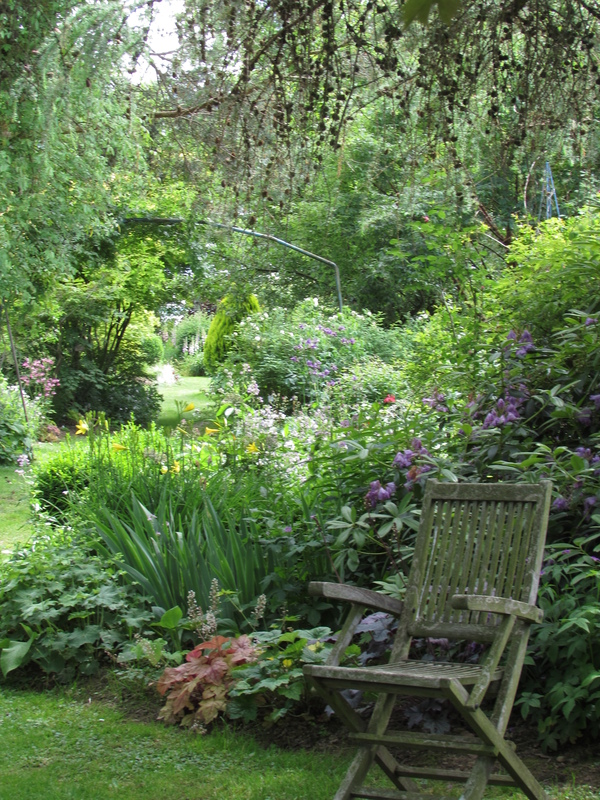 But the garden itself is worth the visit. 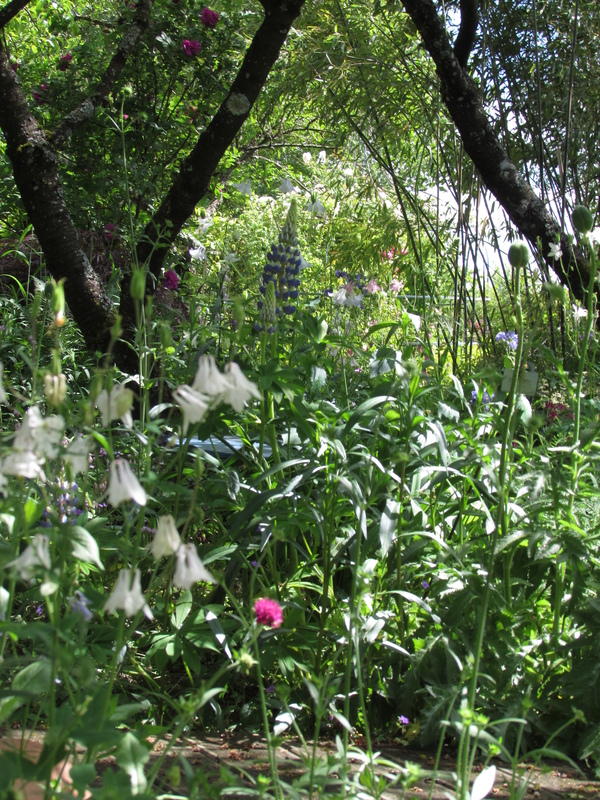 Romantic plantings of aquilegia, foxgloves, geraniums and so forth, all in a rather dreamy, but intimate, setting. 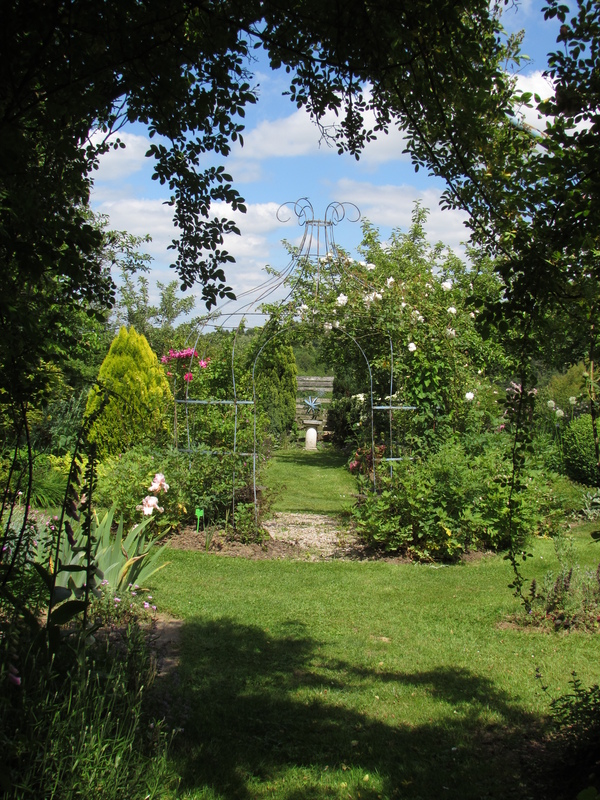 When I was there last year the owners described it to us as a ‘jardin à l’anglais’. 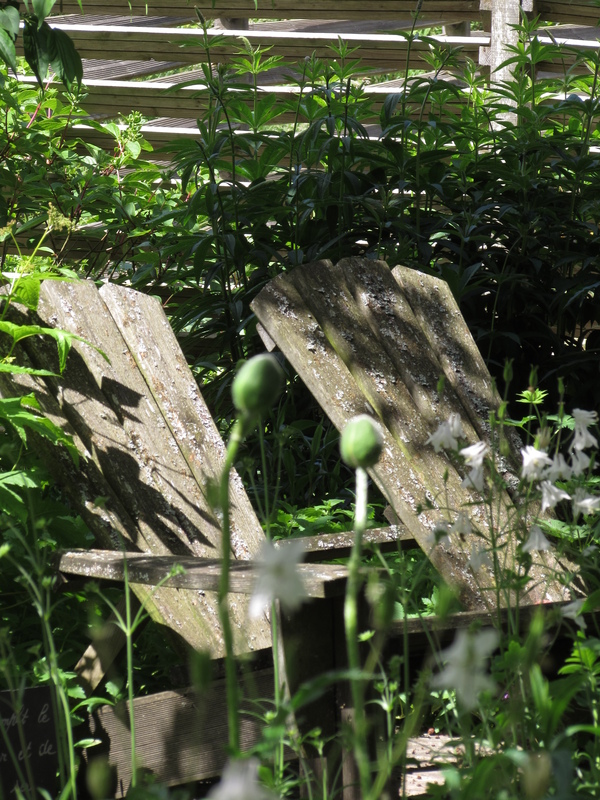 Yes – it’s really rather romantic as gardens go … As romantic as this photographer! 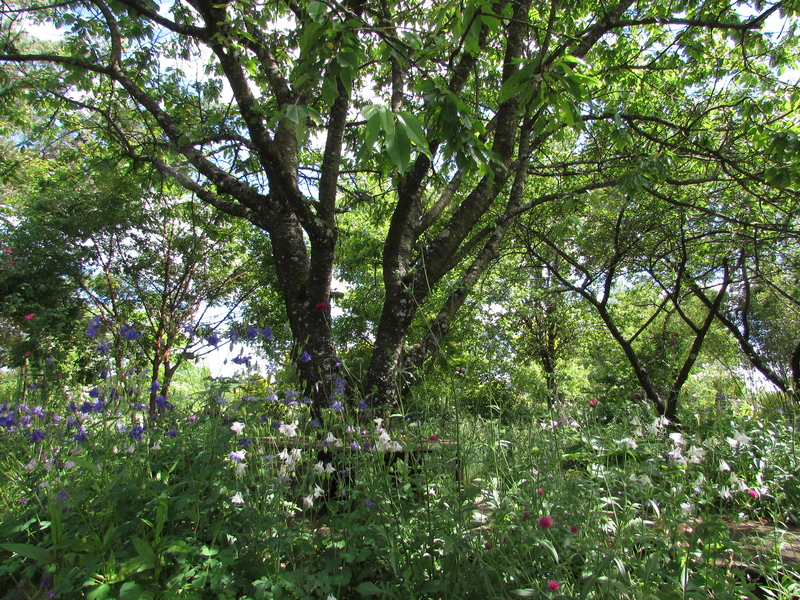 This is a smallish garden (the whole site, including the nursery, is just over an acre).There are a number of different styles and areas under development, but the heart and genesis of the garden has clearly been the shelter provided by mature trees. I do wish I’d asked if the owners had planted them themselves … One of those trees I recognise, I think, as a result of my walnut investigation! Lorraine is definitely not as hot as some areas in France (we rarely experience true drought, although watering at the moment is becoming a bit of a bore). But the plants will nevertheless appreciate the overhead canopy and it’s nice to see that they are happy snuggling up to what appears to be a Juglans regia. 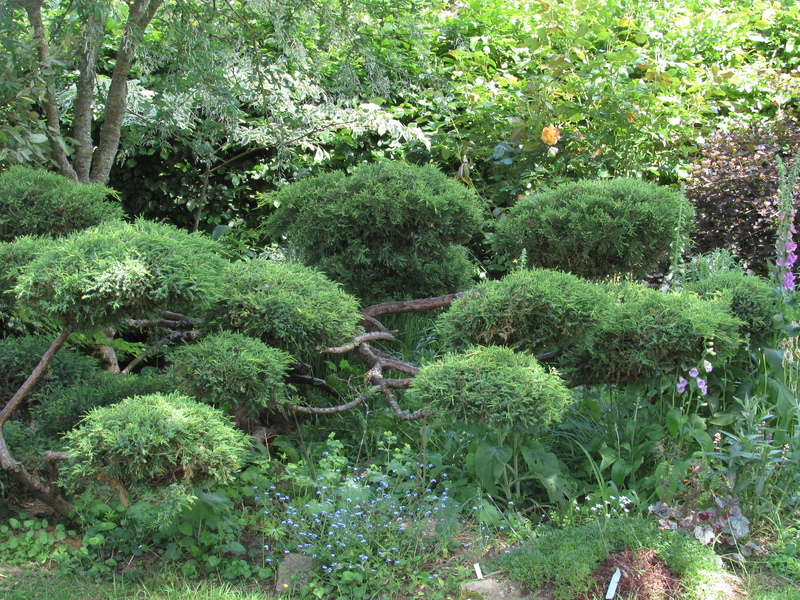 The rather pretty ‘cloud-pruned one’ marks the way to a change of mood in a Japanese-style garden where rhododendrons surprised my eye, simply because I can’t grow them here and I live only about a half hour away. Best of all, the owners seem to have a bit of a ‘seat’ obsession. I heartily approve. 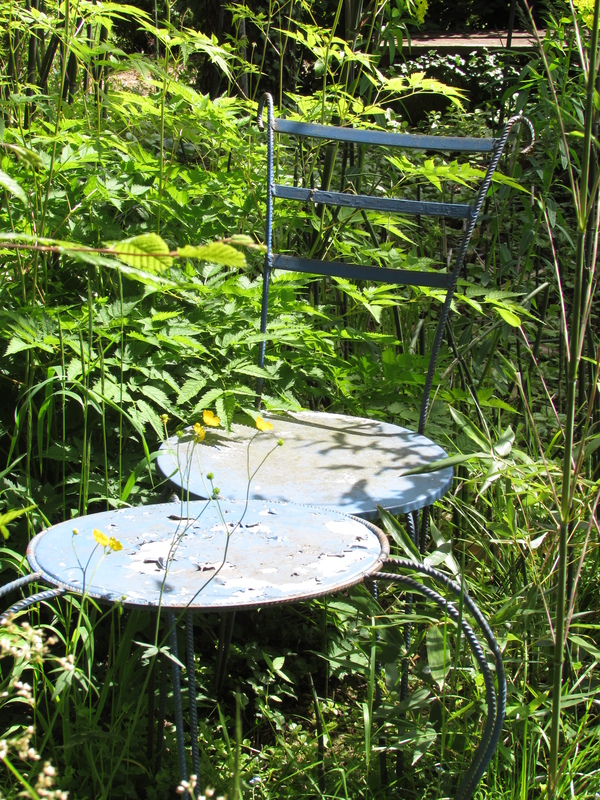 The Jardin d’Ode taught me very clearly that I should be looking at brocantes (junk/antique dealers – even in agricultural equipment) for garden furniture and other items worth painting up. I loved this chair and table in the ‘bambooserie’ (although I noticed that they had had to hack away at the surrounding bamboos a bit to restrain their enthusiasm). 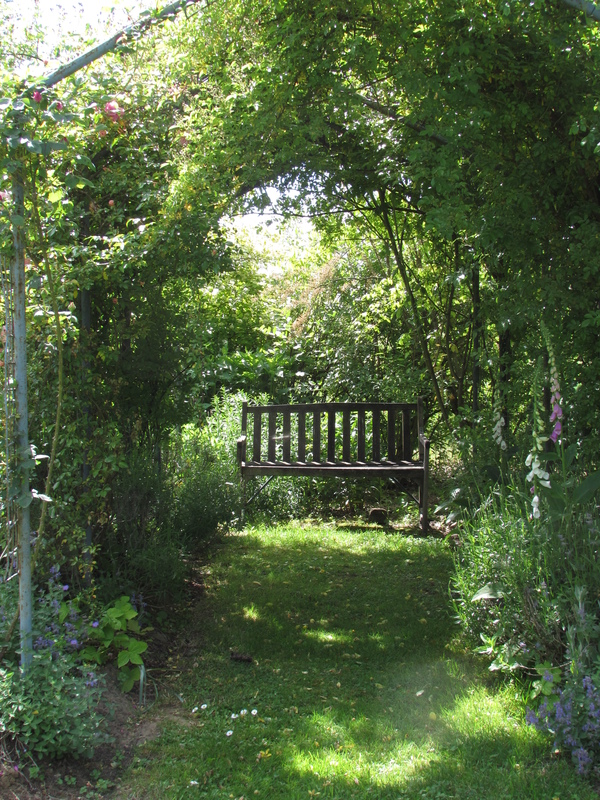 And places to shelter from the hot sun: a seat at the end of a rose pergola and a gazebo which should provide for the tired garden aficionado in years to come when its roses are really up and running. One did really feel the underlying structure without seeing massive evidence of expenditure in the form of expensive paving, pergolas or summerhouses. I think that’s quite a clever trick. And I wish I had one of these! 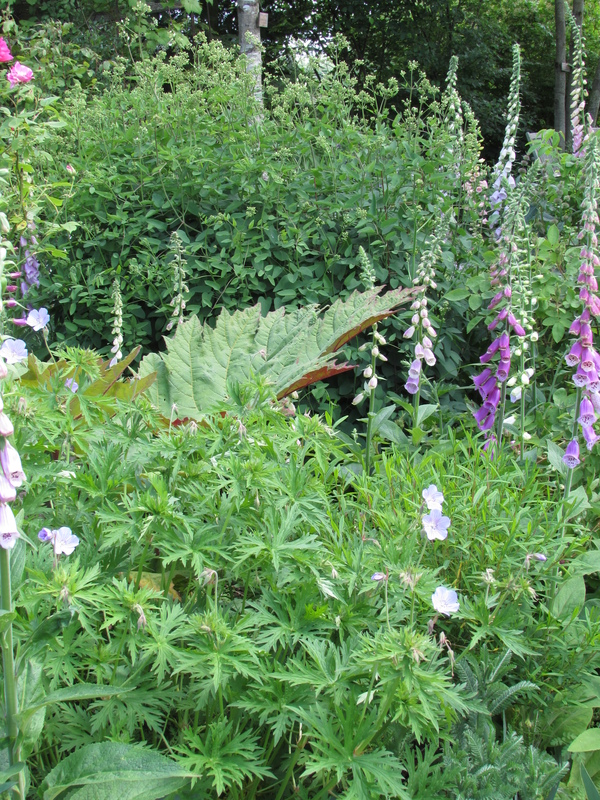 They do well here to add a new area of the garden every year, given that it seems only three of them work it. The last time I visited there was no trace of what has (out from under cover of the trees) become a succulent garden – quite astounding to see opuntias flourishing in Lorraine with our regular -15 winter lows. 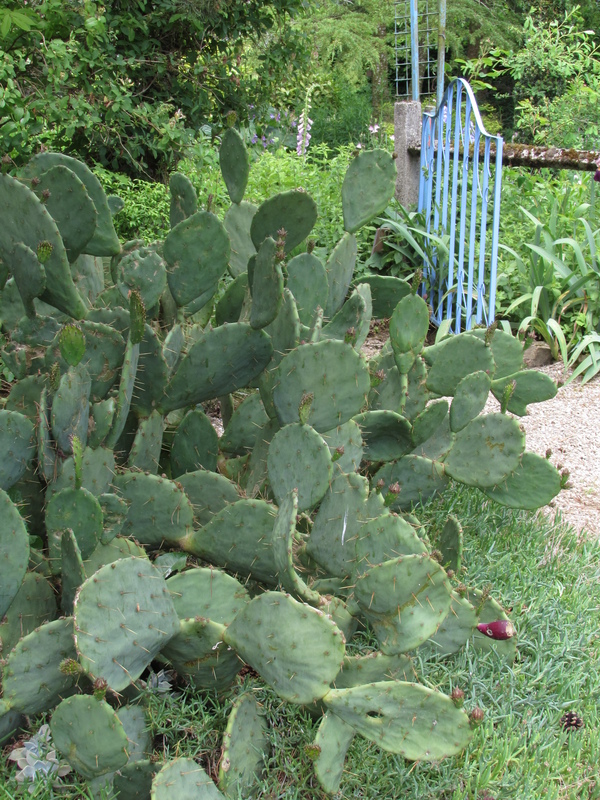 Or am I demonstrating my lack of opuntia knowledge? A few plants leapt up and said ‘look at me!’ For instance this plant, growing up through metal hoops. 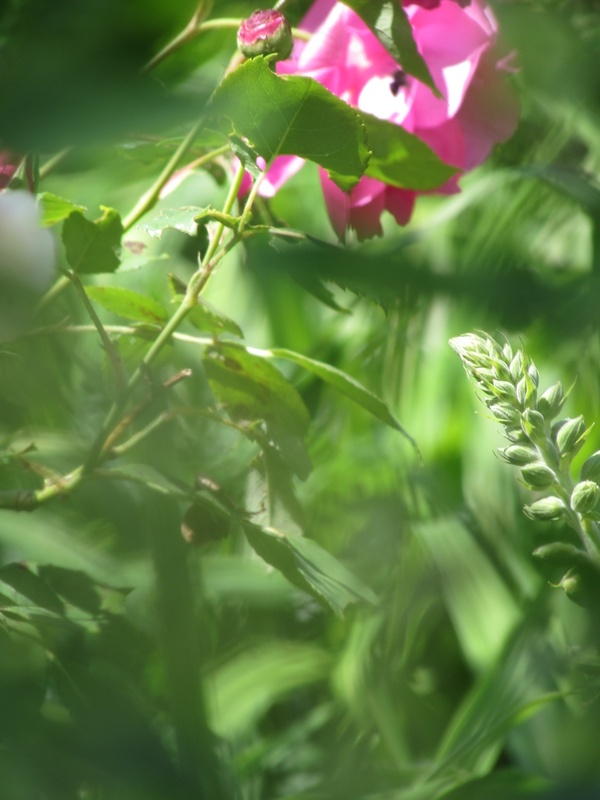 I think it could be a herbaceous clematis and took the picture to ask before I left, then promptly forgot. Any thoughts? 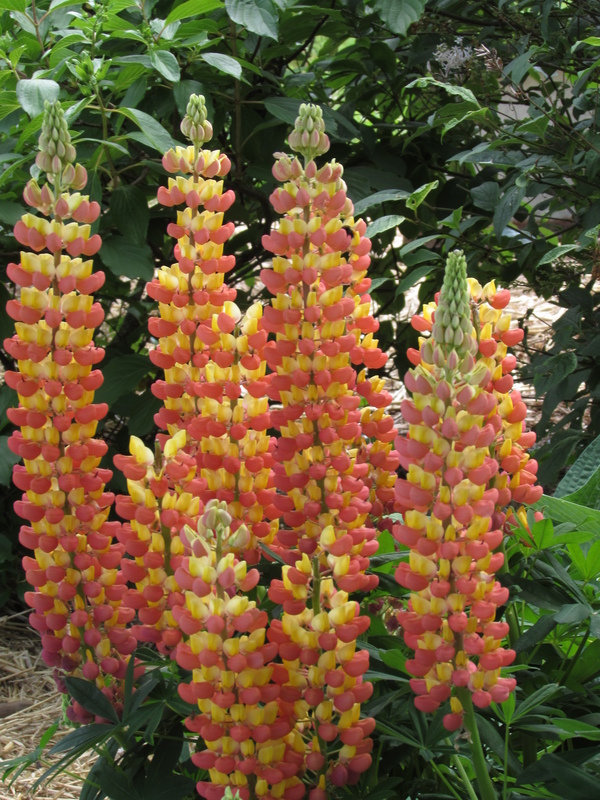 And what a lupin! 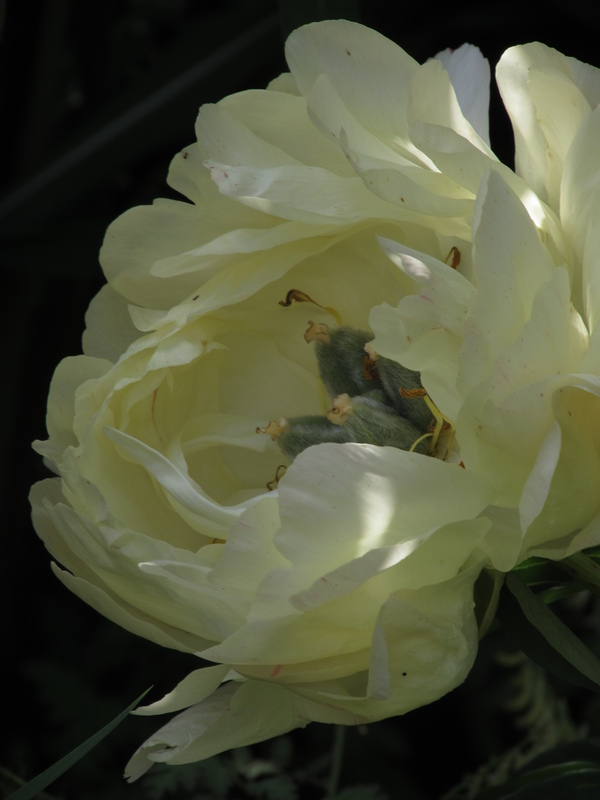 This graceful peony was much more apricot in colour than my picture shows. As I said, there are only three of them making this charming garden. What a place to enjoy the fruits of your labour at the end of a long summer’s day. 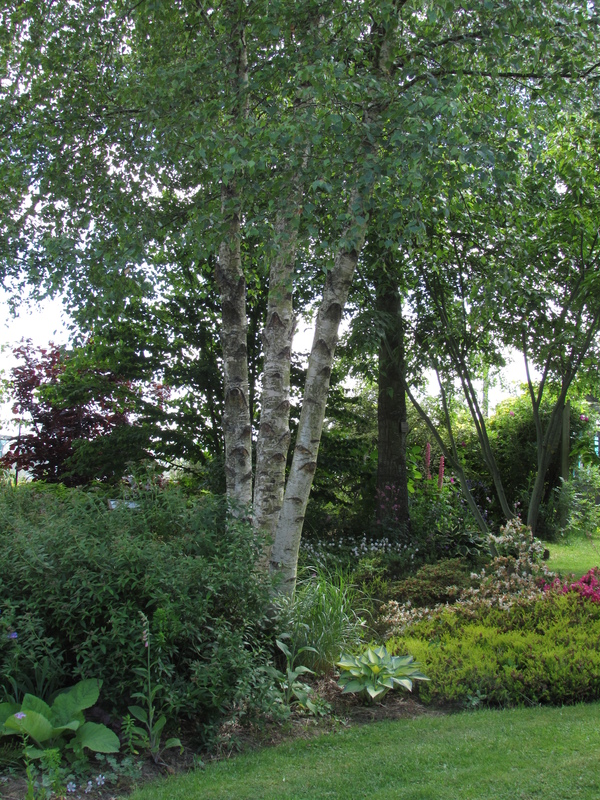 Do visit Jardin d’Ode either virtually by taking a look at their website – or you could always visit in reality and stay overnight at Châtillon-sur-Saône! 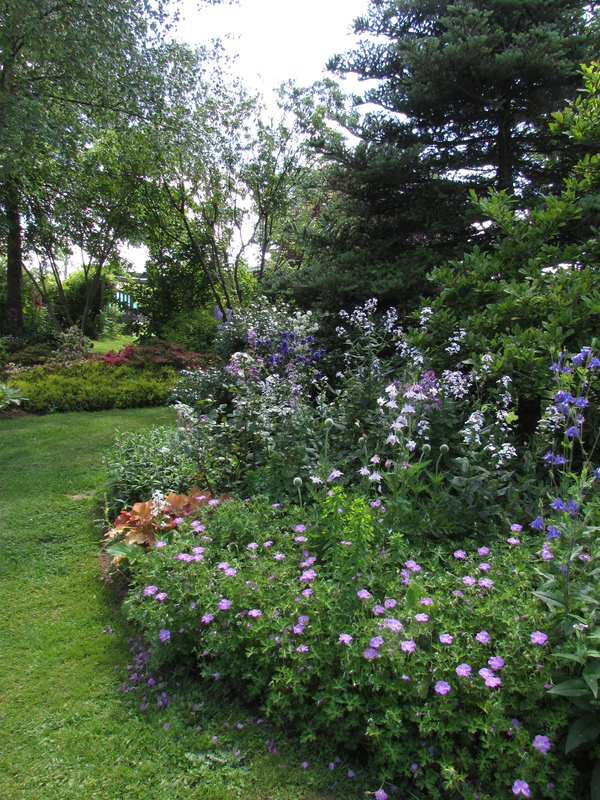 This entry was posted in French gardens to visit on June 12, 2015 by Cathy.